Without a doubt, writing an introduction for an assignment may seem challenging as it happens at some point in time at any university of the matter. Although the process may seem pretty similar, at first, it’s actually more complex than anyone may think: considering the fact that the introduction leads the overall essay to the direction that it should, it’s possible to conclude that it’s actually the most important piece of the entire assignment. 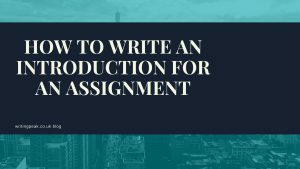 In turn, it may be helpful to figure out all of the essential parts of a good introduction as well as extensively look up how to write an introduction for assignment to assist oneself, especially in the long-term perspective. Without doing so, it’s pretty much impossible to guarantee a high-quality outcome and a perfect mark for the assignment. When undergoing the process of writing the introduction for an assignment, it’s vital to realize the role of introduction in the overall essay. A lot of times, the introduction functions as a lead to the thesis or so-called main argument that you are trying to deliver in the assignment. Without the properly incorporated thesis and accurately written introduction, it becomes merely impossible to write a coherent essay that would abide by all the academic requirements set in the various universities. To this end, it’s better not to hurry up and properly write the introduction to the essay that would open up the topic to the reader. Think of it as of something catchy that would force the reader to finish reading the assignment, regardless of the upcoming content and its quality. For the most part, you should be fine if you grasp the most important info or pose a question you would analyze in the assignment when trying to come up with the introduction. First of all, the good introduction for an assignment is the one that would be leading the reader into the topic of the overall paper. The main purpose of the introduction lies in explaining and introducing the thesis per se, which is why it’s imperative to include these parts when covering the assignment introduction. Furthermore, the questions asked in the introduction should be entirely unique and created by the author to avoid any plagiarism claim from the University of the focus. A lot of times, not having a unique introduction causes problems with the thesis, yet another essential element of the top-notch assignment. Furthermore, it’s important to come up with the introduction in a way that would easily allow the reader to recall it after reading the conclusion: in the end, the final paper should be perfectly coherent and all the pieces should co-exist together with as much ease as possible in the long-term perspective. Finally, no one should forget to look up how to write an introduction for the assignment to the class or ask the professionals for the advice. It’s not going to hurt to ask someone for help, which is why no one should hesitate with such an option. Should I follow the standard structure or come up with something creative? The answer is fully dependent on the nurture of assignment you are attempting to write. When you’re writing an essay, for example, it may be helpful to do everything in the standard manner as adviced by the majority of the professors, whereas the author’s piece of writing should be more unconventional. Before researching the ways of how to write an introduction for an assignment, it may be helpful to realize such a shortcoming. How do I incorporate thesis into the introduction? When trying to incorporate thesis, it may be helpful to figure out the essential hypothesis or theory that it’s supposed to open up in the essay. Without doing so, the process may become fully disorganized and not something that you expected, which may be pretty challenging to do. Still, everything should be pretty simple if following the guideline.